Turn any Young Living essential oil bottle into a convenient, portable roll-on. Simply remove the bottle’s standard orifice, snap on the new fitment and enjoy easy application of all of your favourite essential oils! 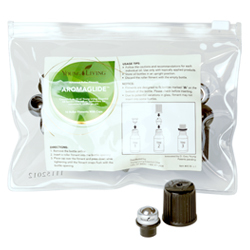 AromaGlide fitments are designed to fit Sb bottles. Check the base of your bottle for the Sb logo before use.